The FRA has released new guidelines for conservation of salmon and sea trout in the River Fowey and it’s tributaries. Return 2 in every 3 rod-caught salmon to the River Fowey. Maintain the current Fowey season limit of 1 salmon per day, 2 per week and 5 per season. 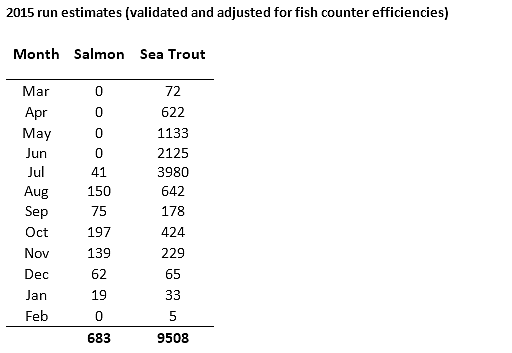 Return all sea trout over 24” (c.6lbs) to support future breeding stock. Thanks to close partnership working between the FRA, SWW and the Environment Agency a sonar fish monitor was placed in the St Neot immediately upstream of the junction with the Fowey for six weeks from 8 December. During that time five releases of water from Colliford were made. The purpose was to establish whether it would be possible to trap broodstock from the St Neot to provide eggs for the refurbished Colliford Hatchery. Initial analysis shows that more than 100 fish over 40cm moved upstream in the six weeks, including some estimated at over 15lb. This gives us confidence that broodstock trapping in the lower St Neot is a viable option. These short clips from the counter show several fish moving upstream.